Avoca is a rural township at the intersection of the Sunraysia and Pyrenees highways 25 km west of Maryborough. It has been a goldmining town, situated in the auriferous areas extending north-westerly from Ballarat to St Arnaud. It is on the Avoca River which has its headwaters in the Pyrenees range, about 20 km south of Avoca. A branch of the river was named by the New South Wales surveyor-general, Thomas Mitchell, on his Australia Felix expedition in 1836, because of its resemblance (in Mitchell’s mind) to the Vale Avoca in Wicklow County, Ireland. Pastoral occupation in the Avoca district began in 1839. In October 1853 gold was discovered at Avoca and by the end of the year there were about 2000 miners there. By the middle of 1854 the number was estimated at 14,000 but the population varied enormously as miners were lured to the other rushes and then back as fresh finds at Avoca raised their hopes. The first religious community at Avoca was the Wesleyans who opened a school in 1855. A National school was opened in 1857. Gold production was sufficient for a sub-treasury building to be built in 1859 and a municipal (borough) district was proclaimed on 25 March 1859. A courthouse was built in 1859 and a town hall was built in 1861. 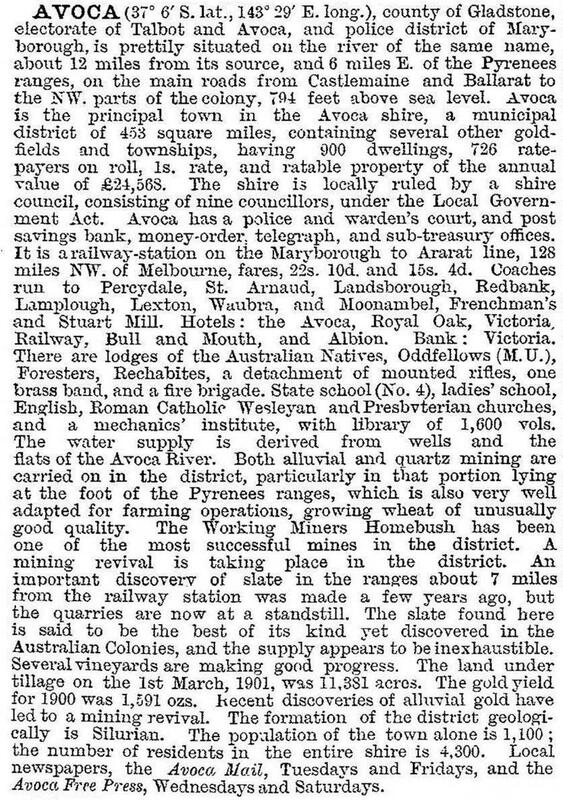 Bailliere’s Victorian gazetteer (1865) recorded six hotels, a bank, the Avoca Mail newspaper and extensive alluvial and quartz gold mining. Avoca was the district centre for nearby mining villages at Amphitheatre, Lamplough, Landsborough, Moonambel and Redbank. The Avoca Shire (1864-1994) was proclaimed on 28 December 1864 incorporating the earlier borough. The mention of fruit acknowledged the existence of orchards since the 1860s and leads on to the re-establishment of wine growing in the Pyrenees foothills. In 1963 the Chateau Remy vineyard was established and during 1970-74 four more were planted, including Taltarni at Moonambel and Robb’s at Redbank. The Pyrenees is an established wine region and tours include travel to the summit of Mount Avoca. in 2007 a fire destroyed the winemaking centre at Pyrenees Ridge wine. Avoca has an extensive range of historic buildings, many of them registered. They include the Bank of Victoria (1854), a National School (1857), a powder magazine (1860), the court house (1859), a police lockup (1867), Presbyterian, Methodist and Anglican church buildings (1864-69) and the railway station (1876). There are several hotel, bank and retail buildings representing a mining town of considerable wealth. The government school building (1878) is similarly representative. The main street has a divided carriageway with a landmark war memorial on its grassed median. Avoca has a golf course, a recreation reserve, a swimming pool and a racecourse which conducts meetings in conjunction with wine festivals, including the Avoca Cup. There are Catholic, Anglican and Uniting churches, a primary school (90 pupils, 2014), two hotels, a motel, a caravan park and a bush nursing hospital. A railway line from Maryborough to Ararat follows the Pyrenees Highway through Avoca. 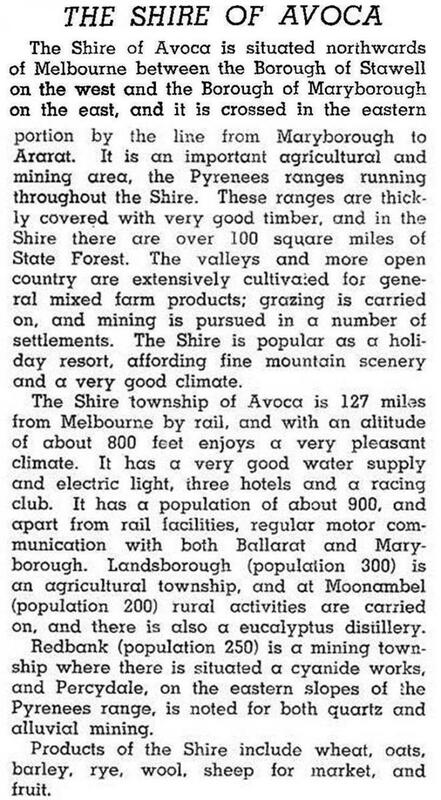 In 1994 farming occupied 62% of Avoca Shire’s area of 1124 square kilometres, on which 203,000 sheep and lambs were carried. There was a small amount of wheat growing (1288 tonnes) and 1081 tonnes of grapes were harvested. On 23 September 1994, Avoca, Lexton and Ripon shires were united to form Pyrenees Shire which has an information centre at Avoca. In 2010 the Pyrenees Shire began the sale and development of a new industrial estate in Avoca, making available blocks of industrial land. In September 2010 and again in January 2011 many parts of regional Victoria experienced widespread severe flooding. The Avoca River flooded causing floodwater to inundate Avoca. In 2011, as part of celebrating 150 years since the town was proclaimed on 6 February 1861, the town developed a Community Action Plan 2011-15 (updated 2013) to address the needs of the community into the future. Issues included retaining youth in the town, developing the heritage overlay, lobbying for a natural gas connection as well as immediate measures to repair damage to infrastructure, especially at the Avoca Public Park, caused by the 2010-11 floods. In 2011 a water desalination plant was opened in Avoca to provide a reliable water supply into the future. It supplemented water from a nearby reservoir with desalinated water from a new bore.